Strathclyde’s sun finally broke through the clouds for more than five minutes on Sunday to shine on the nineteen fresh European champions who were crowned to join the thirty-five who had claimed their titles on Saturday. A total of fifteen European nations saw their flags rise up the podium poles, a fraction down on the last five years, but not by much. 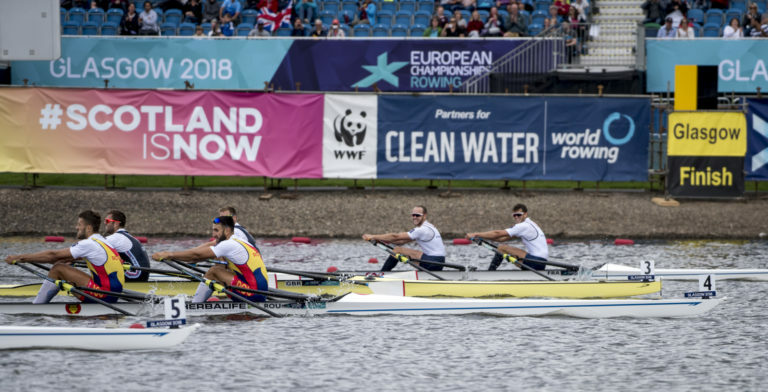 With a crammed media mix zone and apparently 30 countries streaming the action live, the rowing part of the multi-sport European Championships can be considered a roaring success in publicity terms. Romania held on to their top-nation spot, thanks largely to the French, who could have overtaken them, winning only one more gold. 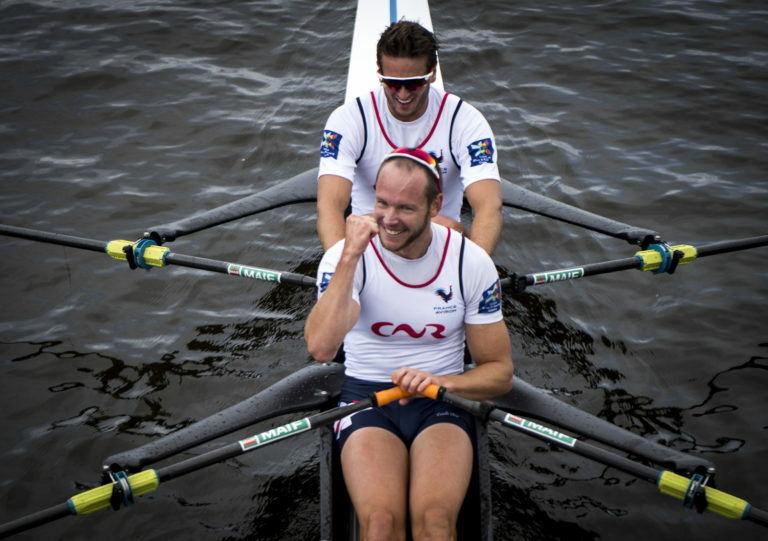 It was in the men’s doubles which delighted spectators with the race of the day, 1.12 seconds separating the top four crews but more than that, the contest staying tense and unpredictable right to the end. Britons Jack Beaumont and Harry Leask had planned to up their first km a notch compared with the semi and duly led the field out early, but the question was how much they would have to pay for this extra front-loading. Their pain kicked in as Hugo Boucheron and Matthieu Androdias (FRA) piled the pressure on brick by brick, encouraged by the chasing Polish double who have a tendency to come good later in the season. Past the British bow went the French, but there was no way the Brits were going to let it keep moving, and the lead swapped back again as the crowd were on tenterhooks wondering how this was going to finish. As the intensity went up another gear for the final few hundred metres, suddenly Romania were snapping at the heels of all three crews, and the French found themselves in fourth, having failed to lift when the rest did. That was soon put right, and as the Romanian rate spiralled the French sprint came with perfect timing, sweeping past the rest to yield them gold as Romania took silver on the nod ahead of Britain. If all finals could be like that it would go back to being a massive popular betting sport, it was so hard to predict. The exact opposite happened in the lightweight women’s doubles, which after a brilliantly close first half with the Poles (technically defending champions) best of a tight bunch, resolved into a show of silky speed for the 2018 world cup champions, the Dutch. 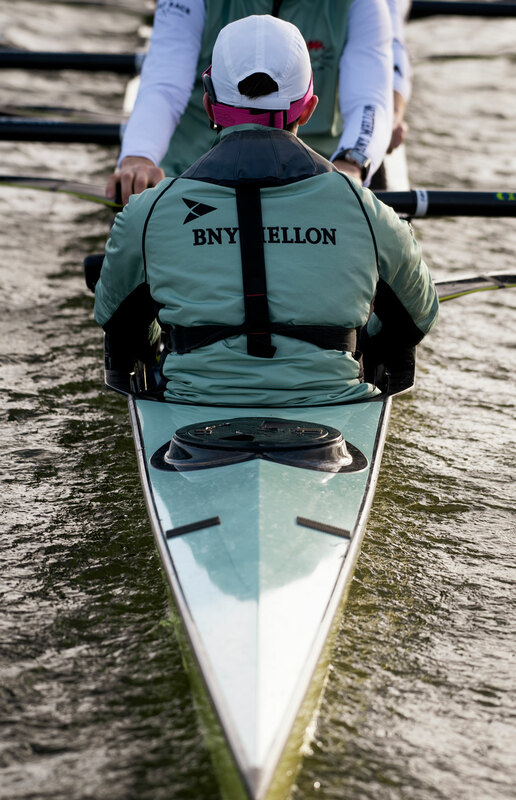 At their best, lightweight queens Marieke Keijser and Ilse Paulis scull as if on oiled wheels: where other rowers hunch their shoulders up with the effort and tug on the blades, they glide along as effortlessly as if rowing steady state past their home dock. Close behind Poland from the start, they flowed smoothly through them soon after half-way and simply kept on going, while the rest of the field ended up in the perfect arrow shape (middle lanes quickest, outside lanes slowest) so prized by the FISA Fairness Commission. 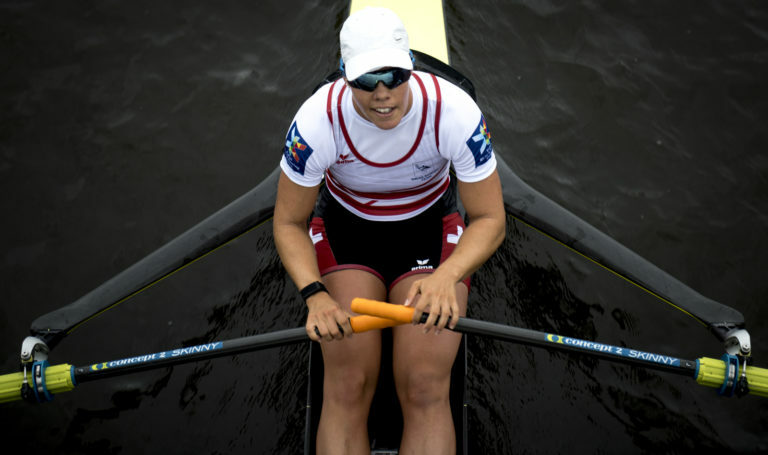 Only the sight of Paulis slumped exhausted over her oars after the line showed how hard the Dutch, back on the scene after an interrupted 2017 season, had been working. 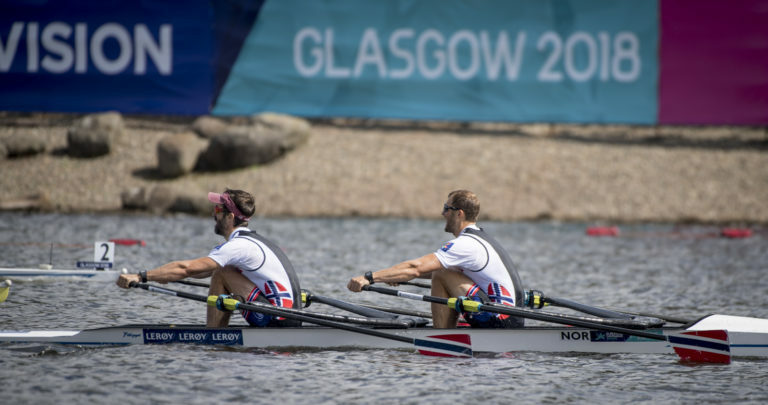 The lightweight men’s doubles went to Norway’s Kristoffer Brun and Arun Strandli, but only by dint of them throwing the kitchen sink, taps, cooker and waste bin at the race. The problem was the Irish O’Donovans, known to be dangerously speedy in the second half and, in the absence of B-final winners France, the crew the Norwegians could least afford to let get a sniff of gold. Norway, quickest at every stage of this regatta, disposed tidily of quick starters Italy and then had to defend their lead position against a sustained charge by the Irish double. They did it, and bagged the European title with a highly effective end sprint, but the sense of them being under severe pressure was palpable, a foretaste of how intense this boat class will be in September. 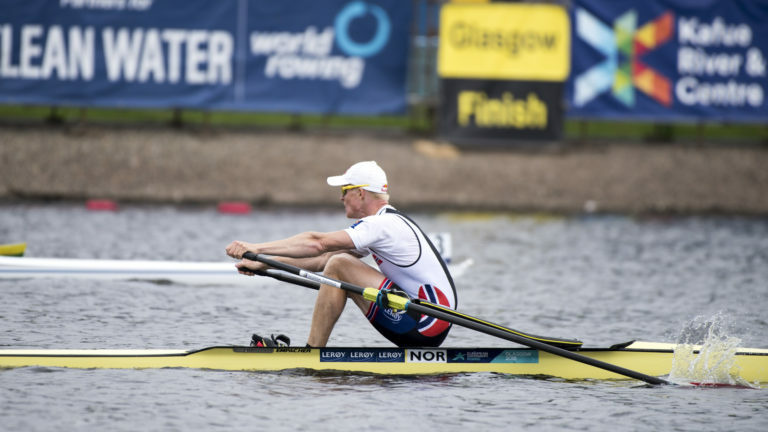 Norway’s second gold came courtesy of Kjetil Borch, the former doubles world champion who has been more of a bridesmaid in the single, and was balked by Mahe Drysdale’s wily persistence of the Diamond Sculls in Henley a month ago. In a Kiwi-free field Borch could unleash his biggest puddles and seized gold after a fascinating to-and-fro in which the lead changed at least four times, with him being the last sculler to take it. The sight to savour was Lithuania’s Mindaugas Griskonis, a notorious sprint king in his early singles races, taking on the lead in his old style only to lose it to an unflustered Borch after the final timing marker. Griskonis wasn’t about to give up and started a punishing sprint to the line, only to discover that Borch still had a gear in hand and was going up again. The end margin was a mere few feet to the Norwegian, while Swiss Roman Roeoesli took advantage of the frenetic finish to stay head of Pole Natan Wegrzycki-Szymczyk for the bronze. The lightweight men’s singles weren’t lucky enough to have the season’s leader absent: Michael Schmid has been an unstoppable force recently and was in full cry for the final, going out hard and fast with a desperate-looking Peter Galambos (HUN) initially beside him. The joker in this weekend’s pack was Martino Goretti, Italy’s answer to the Flash, who pushed constantly from 750m onwards, never relenting in his attempt to get past Schmid. It didn’t work, but only because the Swiss sculler was prepared to stay above rate 38 for most of the last 500m in order to secure the title. The effort of trying to stay with them cost Galambos a medal, burned away along with Germany’s Lars Wichert as Brit Sam Mottram, who had been lagging after a wonky start, fired off a great last 500m to earn bronze but too late to challenge for the higher medals. Schmid is rarely under that pressure and clearly has all the answers, whatever others throw at him. Kudos to Goretti who thoroughly deserved the silver. The women’s singles also went the way of the Swiss form book, this time Ukrainian Diana Dymchenko impressing everyone by fearlessly trying to challenge all-round champion Jeannine Gmelin along most of the course. Never previously successful internationally despite a lengthy career, Dymchenko for once did everything right. Austrian Magdalena Lobnig was underwhelming for most of the race, and as these three moved steadily into the medal positions, the question was how much would Gmelin have in reserve for a sprint. The answer was lots: she made sure Dymchenko’s bow only got a couple of feet overlap before she started charging, and as Dymchenko’s poise crumpled in the final dash, Gmelin coolly lifted one more time. As she claimed the only title she lacked from 2017, Lobnig finally went for it, passing the fading Ukrainian with the ease borne of experience to take silver. The lack of Lucerne champion Marie-Louise Draeger (GER), who has looked under the weather here and pulled out of the final in the morning, diminished the lightweight women’s singles. In an unevenly paced race it was Belarussian former openweight Alena Furman who steadily dropped all her rivals to confirm her status as a seriously dangerous competitor in her new event. The final race was yet another victory for the all-conquering German DeutschlandAchter, surging from a slightly controlled start while others spun their wheels into an inexorable lead which the Dutch, the next best crew, could not match. Two eights — the Italians and British — had been struck by final-day sickness, Olympians Fabio Infimo and Moe Sbihi having to be substituted. Both crews faded along with the Russians, while it was the mainly under-23 Romanian eight which got within a couple of feet of the Dutch and grabbed bronze. And so the last senior competition before the worlds closed, with a flag transfer ceremony as the men’s eights stood to form a human backdrop to officialdom. Next stop Plovdiv, where the rest of the world joins the party.